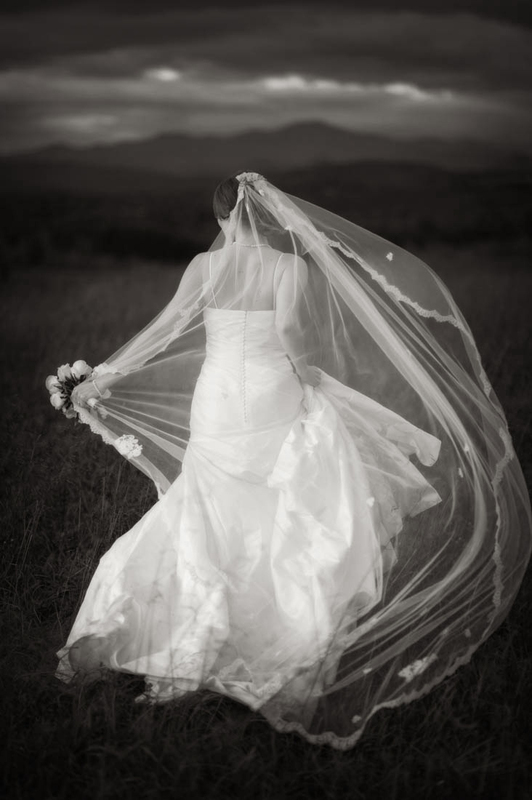 In an image taken during a stormy bridal session at Chattooga Belle Farm the brides veil and dress blow tumultuously in the wind. TheChattooga Belle Farm is an amazing venue at the bottom of the Blue Ridge Mountains. The vast 198 acres on this farm looks out to the mountains surrounding you with the Long Creek wrapping around the foot of the mountains. This farm is a working farm and distillery located in Longcreek South Carolina. They also have a event barn that hosts wedding like this one in a gorgeous open air barn with string lights and amazing food that they grow on the farm. This couple was in love with the venue and couldn't get enough of the mountains around them. It was a stormy day which isn't the best for a wedding but we saw an opportunity while it was just a little windy before the storm rolled in, to take some shots of the bride. Well the bride was just in awe of the mountains as we were so we wanted to encapsulate them in her bridal portraits. This photo we really wanted care free and majestic in a way as she walks out to the mountains with her bouquet in hand, as if running towards the mountains to go find her groom. With the dark backdrop from the sky it really made all the details in her dress, the bouquet, and vail just pop right off. Then her vail just went a long with the wind being swept away just slightly to just give us more romance to the picture. To top it all off and to make everything pop just a little bit more we decided to make this a black and white photo.